Last Saturday, Yoram, Alix, Valerian, and I went to Kepler’s, the venerable Menlo Park bookstore. Besides buying Geoff Nunberg’s witty collection of his best Fresh Air segments, called The Way We Talk Now (which I recommend), I also bought a 2007 calendar. Was that an eye-roll I detected from the check-out clerk when he rang up my purchases? A 2007 calendar and a chocolate bar imported from New Zealand with Christmas packaging (half off! 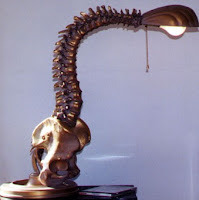 ): surely the signs of a demented bargain hunter, one of those people who haunts garage sales, looking for hideous lamps that almost work. It was deep-discounted. 99 cents—not even a whole dollar—for one of those glossy calendars you hang on the wall. If you’re a stickler for temporal appropriateness, you buy your calendars months ahead of the coming of the New Year. Possibly in October. Or perhaps even earlier if you’re compulsive. You might have to buy one in June if your dentist makes teeth-cleaning appointments six months in advance and you’re due in January. Buying a calendar in June, 2006 so I'd have it in January, 2007? Crazy. I’d lose it before then; calendars just aren't that big. They can easily fall in among a stack of old Sunday Chronicles and get recycled. Furthermore I have to consider what would happen if we, as a society, adopted an new calendar system between now and then. If I bought a calendar early, I’d be so screwed. 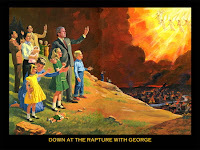 Or what if the nutso fundamentalists are right and the rapture is upon us? No need for a calendar then—a waste of funds that could be used to buy one’s way into heaven. The good thing about buying a calendar in the middle of the year like this is that you know the score. The world hasn’t ended nor has the calendar system changed. And you know you’ll be contributing to your own self-improvement: all those appointments, meetings, and dates you’ve missed so far? You won’t be doing that any more. You’ll have a calendar to consult. Or look at it this way: 99 cents for 9 remaining months. That’s only 11 cents per month! Normally you’d pay $11.99 for this calendar, at least according to the bar code printed on the back. That’s almost a dollar per month, and even more if you fold in sales tax and so on. So I got a full order of magnitude discount. How often can you say that? And what else can you get for 11 cents per month? There’s no way to go wrong here. After all, only three months of the 2007 calendar are obsolete, used up. And even those months, they’re not really used up: they’ll come around again. Next year. You just ignore the day-of-the-week discrepancy—and who pays attention to days of the week anymore anyway, given that we're all transhumans living in a post information age—and you’re good to go until next April. When, once again, calendars are deep-discounted at Kepler’s. The only downside of this strategy is that you’re left with the less popular—and probably less attractive—calendar themes and photos. Gone are the Warhol calendars, the perfect tropical beaches, and the low riders of East LA. Remaining are Outhouses of the World (I’m not making this one up), Classic Buicks, and Cute Puppies and Adorable Kittens in Soft Focus. Themes that aren’t even good from a hip standpoint of detached irony. After some hemming and hawing over the calendar collection that remained, I found something acceptable, a wall calendar with photos of Mexico. Not perfect, but reasonably easy on the eyes. I can see April’s calendar from where I sit. The photo shows a row of high-rise hotels and condos on the beach in Puerto Vallarta at either the waxing or waning of the day; the ocean is shadowy, not brilliant aqua like it is in most photos of that part of the world. The beach is called “Playa los Muertos”, which given the unreliability of my Spanish might mean Beach of the Dead (which sounds like it’d attract a lot of flies) or it might mean something else entirely. I’m not sure. But the palm trees and strolling beachcombers are lovely and evocative and most certainly not dead. If I could snap my fingers and go there, I probably would. 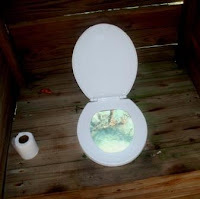 I’m so glad I didn’t buy the “Outhouses of the World” calendar; I’d have it forever. I keep my old calendars. I’m not sure why, since if I’m this late for a party that happened in 1998, no-one’s going to be impressed if I show up now, even if it’s the party’s exact anniversary and I’ve brought a bottle of Merlot and some ripe brie. 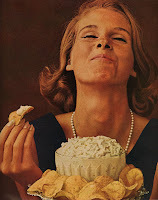 The Lipton Onion Soup dip is probably all crusty by now, the chips stale, and all the other more normal guests have gone home. “What’re you doing here, Cathy?” My putative hosts ask. They’ve changed in the intervening 9 years from a fun-loving wild young couple to frumpy suburbanites with several elementary school-aged children. “Uh. The party… The party… Oh. Never mind.” I say. Whatever. I can eat the cheese and drink the wine myself. At home. After I’ve gone to 7-11 and bought some crackers to put under the cheese. It’ll make a swell supper. I don’t know why I keep old calendars. I really don’t. Here’s a datebook from 2002 – a Mexican theme again – and it just reminds me that I did almost nothing in 2002; it’s not that different from this year really; I could’ve reused not only the calendar, but also all the appointments inside it. Parties I didn’t attend. Doctors’ visits I dreaded. I traveled to Portland, Baltimore, Chapel Hill, Seattle, LA, Memphis, Minneapolis, and San Antonio, but it’s likely I have a frequent flyer statement that’d bring to mind of all those destinations just as well as my calendar does. Saving calendars would be more apt if I led a more eventful life. 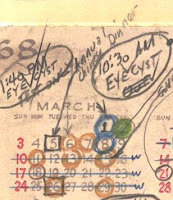 Yoram gave me a calendar from 1968 that he found in a drawer at a used furniture store on Valencia Street. 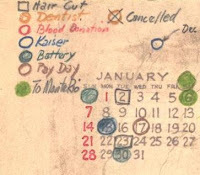 The guy who kept this calendar was no slacker: he didn’t go to Kepler’s on a fine April afternoon and buy the best of the leftovers. Rather he lettered his calendar himself, in a neat draftsman’s hand. At first I thought it was printed, but when you look at the spacing and the minor irregularities, you realize he’s just one neat fellow. Look: March was a busy month, between the eye cyst, 7 dental appointments (one for a gold casting of his tooth), 2 doctors’ appointments, and a trip to Monte Rio. On March 5th, he got his hair cut, presumably to impress his compatriots at the Annual Chinese Dinner later that evening. I’m mildly surprised that Kepler’s still stocks paper calendars like my 11 cents-per-month model. Mr. X might’ve been well satisfied by an Outlook calendar, which is just as tidy as you please. You can edit labels and assign colors to them, so you can block off your days like Mr. X did. I’ll miss paper calendars when they disappear. There’s hardly anything written in this Hecho en Mexico 2002 Engagement Calendar. When’s the next year that January 1 falls on a Tuesday? It means something to me when Omar says that my blog posts are "good written." Last time he commented on my blog, ol' Omar Cruz thought I might be interested in some high quality hemp-related (and possibly hemp-based) goods; this time, it's a land deal in Costa Rica. Wonder what he'll offer me next time... Move over, Mohan Shrestha, you've got competition!